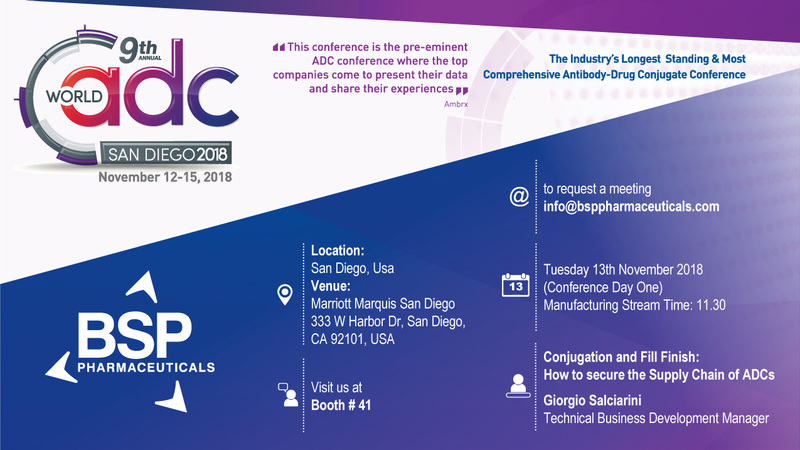 BSP Pharmaceuticals S.p.A. is proud to announce Its participation to the 9th edition of World ADC Summit of San Diego, (CA), USA from 12 to 15 November 2018. This Summit is now at Its 9th year. It covering every element of ADC development, World ADC curates cutting-edge science and transformative insight enabling you to: discover payloads with differentiated mechanisms of action, deepen your understanding of ADC clinical pharmacology to effectively translate into the clinic and simplify processes for more efficient ADC manufacturing. Save the Date!!! Next November 13, 2018 (Conference Day One), at 11.30 AM, in the Manufacturing Stream, Giorgio Salciarini – Technical Business Development Manager of BSP – will presents the speech ‘Conjugation and Fill Finish: How to secure the Supply Chain of ADCs’.